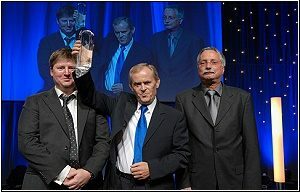 On 30 October 2010, VKK Standardkessel Köthen GmbH was honoured as a premier finalist at the award event of the Oskar Patzelt Foundation in Berlin as part of the competition “Großer Preis des Mittelstandes”. 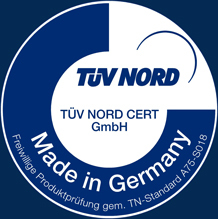 The Köthen-based company had already been an award winner in 2004 and was nominated as a premier by IHK Halle-Dessau and the City of Köthen for the second time since 2009. The award criteria include the overall performance of the company, the creation and securing of jobs and apprenticeships, innovation and modernisation, service and customer proximity, marketing as well as commitment in the region. Lothar Velde, Chairman of the Management Board, together with Managing Director Dietmar Bünk and his son Lars Velde, who is also part of the company management, accepted the high honour for mid-sized companies for VKK Standardkessel Köthen GmbH. He emphasised the years of dedicated and successful work of the highly qualified and motivated staff at the company’s locations in Köthen and Duisburg. The company is known in the industry as the technological leader in the field of industrial steam and hot water boiler plants. Its strengths include meeting individual requirements of sophisticated boiler plants as well as the provision of turnkey energy generation plants from one source.